2001 Jayne & Leonard L. Abess, Jr.
1990 Bertha & Leonard Abess, Sr.
2007 Adalberto “Al” Vara, Jr.
2001 George F. Knox, Esq. 1998 Henry H. Raattama, Jr.
1994 Pedro Jose Greer, Jr., M.D. 1989 Alvah H. Chapman, Jr.
2011 Publix Super Markets, Inc.
2001 Royal Caribbean Cruises, Ltd.
1997 SunTrust Bank, Miami, N.A. 1993 Fine, Jacobson, Schwartz, Nash, Block & England, P.A. 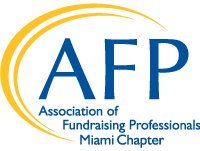 1999 The A. D. Henderson Foundation, Inc.
*Lifetime Achievement & Champion of Philanthropy recipients are awarded solely at the discretion of the AFP Miami Chapter. Outside recommendations and/or applications will not be accepted nor honored.